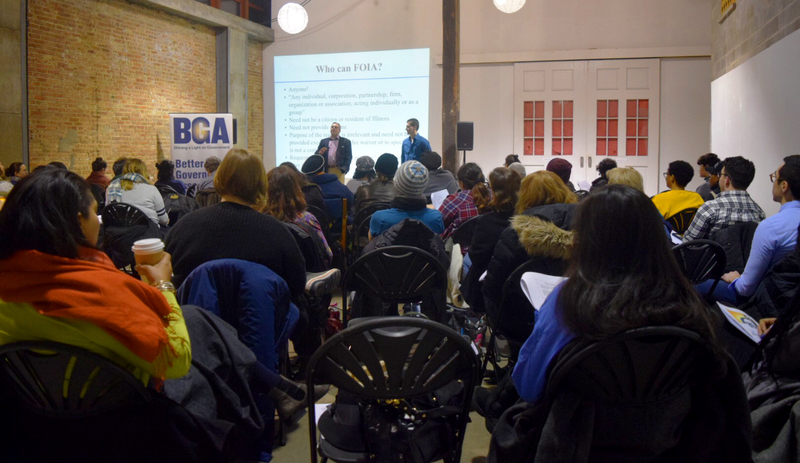 About eighty Chicago residents from the South Side learned they can file Freedom of Information Act requests anonymously during a watchdog training session hosted jointly by the Better Government Association and City Bureau. City Bureau is a nonprofit civic journalism lab based on Chicago’s South Side known for its public newsrooms. The BGA and City Bureau used that public newsroom to host a special citizen watchdog training session. The BGA’s Civic Engagement Coordinator, Annum Haider, opened the program by delivering “Ten tips on how to be a Watchdog.” These included pointers on how to effectively track government in communities and neighborhoods, how to monitor questionable behavior, and how to conduct relevant research. BGA Engagement Editor Mia Sato live-tweeted the entire event, while Marketing Manager Starlyn Matheny was the official photographer of the night. The BGA’s outside counsel, Matt Topic, and his associate, Josh Burday, began the heart of the presentation by delving straight into the Illinois Freedom of Information Act—its various components and provisions. They also spoke about the Open Meetings Act. Topic walked the audience through Illinois’ FOIA statute, dissected each provision and took citizens through the practical steps of learning who handles FOIA requests in various government offices, how best to write a request, and what to expect from responding governments. Audience members were particularly interested in the anonymity with which they could file their FOIA requests. Even those with experience filing FOIA’s were surprised to learn that they are not required to disclose their names when filing a FOIA request. While learning about the various bodies exempt from FOIA, some audience members said they were dismayed to learn they could not FOIA their aldermen. But many of them were interested to learn they can still FOIA employees who work for their Aldermen — a point raised by BGA Policy Manager, Rachel Levin. Matt Topic also noted residents can FOIA City Council. Those who make FOIA requests after attending BGA Watchdog Training sessions are encouraged to share their FOIA experiences with the BGA and to send follow-up questions. Watchdog Trainings are open to the public, free of charge, and can be conducted at various Illinois locations. To see the schedule for Watchdog Trainings, check the BGA events page on our website.